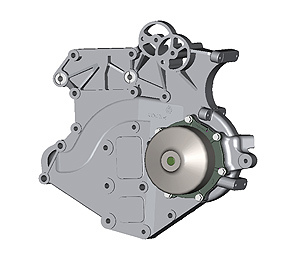 The water pump designed by Concentric Pumps Ltd. for the new 12 litre, 6-cylinder ASET™ engine from Mack Trucks Inc. The new pump is an integral part of the front end assembly which also incorporates the pump inlet, pump outlet and the pump volute. Other parts mounted direct on to the front assembly are a fan bracket, belt tensioner, air conditioning compressor and coolant conditioner. The ASET™ engine (Application Specific Engine Technology) has been built to comply with federal emission legislation and incorporates both cooled exhaust gas recirculation (CEGR) and a variable geometry turbocharger. The pump and front cover will be supplied by Concentric Inc. Based in Itasca, Illinois, USA, Concentric Inc. is one of three manufacturing plants within the Concentric Group, a major supplier to the world's truck, agricultural and construction equipment industries. The company manufactures oil, water and fuel transfer pumps, as well as integrated front cover assemblies for diesel engines. In addition, it also supplies lubrication pumps for transmissions and reciprocating compressors and fans for engine and other applications.